Gary Alan Sinise (/sɪˈniːs/; born March 17, 1955) is an American actor, director and musician. Among other awards, he has won an Emmy Award, a Golden Globe Award, a star on Hollywood Walk of Fame and has been nominated for an Academy Award. Sinise is known for several memorable roles. These include George Milton in Of Mice and Men, Lieutenant Dan Taylor in Forrest Gump (for which he was nominated for the Academy Award for Best Supporting Actor), Harry S. Truman in Truman (for which he won a Golden Globe), Ken Mattingly in Apollo 13, Detective Jimmy Shaker in Ransom, Detective Mac Taylor in the CBS series CSI: NY (2004–13), and George C. Wallace in the television film George Wallace (for which he won an Emmy). From 2016 to 2017, Sinise starred as Special Agent Jack Garrett in Criminal Minds: Beyond Borders. Sinise was born in Blue Island, Illinois, son of Robert L. Sinise (born 1928), a film editor, and his wife Mylles (Alsip) Sinise (born 1928). His paternal grandfather was of Italian descent, Sinise's great-grandfather Vito Sinisi having immigrated from Ripacandida, in the Italian region of Basilicata. 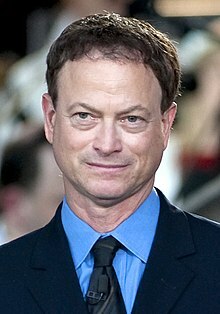 Sinise briefly attended Glenbard West High School in Glen Ellyn, Illinois, and later graduated from Highland Park High School in Highland Park, Illinois, followed by Illinois State University. In 1974, Sinise and two friends, Terry Kinney and Jeff Perry, founded the Steppenwolf Theatre Company. Since then, Steppenwolf has showcased the talents of notable actors such as Joan Allen, Kevin Anderson, Gary Cole, Ethan Hawke, Glenne Headly, John Mahoney, John Malkovich, Laurie Metcalf, Martha Plimpton, Jim True-Frost, and most recently William Petersen. Sinise honed his acting and directing skills at Steppenwolf, and received a Joseph Jefferson Award for his direction of Lyle Kessler's play Orphans. That took him from Chicago to New York City, and then to London's West End, where he worked on more than thirty of the company's productions. On April 17, 2017, Sinise received a star on the Hollywood Walk of Fame for his work in the television industry, located at 6664 Hollywood Boulevard. On Oct 30, 2017, Sinise was selected as Grand Marshal of the Pasadena Tournament of Roses Parade on January 1, 2018. Sinise is a supporter of various veterans' organizations, both personally and through the Lt. Dan Band. He frequently performs on USO tours at military bases around the world, and volunteered for the National Vietnam Veterans Arts Museum now called the National Veterans Art Museum. On June 8, 2011, he put on a space suit to become one of the few people to fly in a U-2 spy plane up to 70,000 feet (21,000 m). Sinise is also on the Advisory Council of Hope For The Warriors, a national nonprofit dedicated to provide a full cycle of nonmedical care to combat-wounded service members, their families, and families of the fallen from each military branch. In December 2011, Sinise was the narrator at the Candelight Processional at Disneyland. In August 2012, Sinise was honored at the United States Navy Memorial, by Master Chief Petty Officer of the Navy (MCPON) Rick West, and was made an honorary U.S. Navy Chief Petty Officer for his efforts in helping veterans. On August 29, 2013, he was named an honorary Marine by the Commandant of the Marine Corps. In 2006, Sinise began co-hosting the National Memorial Day Concert on the Mall in Washington, D.C., with actor and Illinois native Joe Mantegna. He serves as the national spokesperson for the American Veterans Disabled for Life Memorial and spends much of his time raising awareness for the memorial and other veterans' service organizations. In 2012, he was honored by the Joe Foss Institute for his dedication to veterans. In 2013, he was awarded the third highest honor within the Department of the Army Civilian Awards, the Outstanding Civilian Service Award, for substantial contributions to the U.S. Army community through his work with the Gary Sinise Foundation. He participated in Troopathon VI for 2013, as he has in the past, to help raise money for care packages for American troops. He received 2015's Sylvanus Thayer Award, awarded by the West Point Association of Graduates to a non-West Point graduate whose character, service, and achievements reflect the ideals prized by the U.S. Military Academy. Sinise married actress Moira Harris in 1981. They have three children: Sophie (b. 1988), McCanna Anthony (b. 1990), and Ella (b. 1992). In 2003, Sinise was awarded an honorary Doctorate of Humane Letters by Amherst College. He has been awarded the U.S. Presidential Citizens Medal. Sinise is a devoted fan of the Chicago Cubs and the Chicago Bears. He also is a fan of the band Kansas. Sinise is a practicing Roman Catholic. He converted to the faith on December 24, 2010. His wife, Moira, converted in 2000. In September 2012, Sinise donated to Republican presidential nominee Mitt Romney. Sinise's Republican-leaning has been written into his character of Mac Taylor who has a picture of Ronald Reagan displayed in his office, and is once the subject of a joke by one of his colleagues about an eight-hour documentary about Reagan he keeps watching over and over. Although a staunch supporter of the Republican Party, Sinise refused to vote or show support for Donald Trump in the 2016 presidential election. After Trump questioned McCain's status as a hero because he was captured as a prisoner of war, Sinise rebuked Trump. Hunter Lord Rutherford Episode: "Lullabye"
2004–2005 CSI: Miami Detective Mac Taylor Episodes: "MIA/NYC NonStop", "Felony Flight"
Sinise, Gary; Brotherton, Marcus (contributor) (2019). Grateful American: A Journey from Self to Service. Nashville: Thomas Nelson. ISBN 978-1-40020-812-8. ^ "Gary Sinise Awarded Walk of Fame Star For Acting, Pro-Military Activism". Fox News. April 17, 2017. Retrieved April 18, 2017. ^ John O'Mahony (July 15, 2000). "The guts and the glory". The Guardian. Retrieved November 7, 2010. ^ "Gary Sinise Biography (1955–)". Filmreference.com. Retrieved December 17, 2009. ^ The Film daily year book of motion pictures, Volume 47. J. W. Alicoate. 1965. p. 324. ^ Byrne, Bridget (February 7, 2007). "SouthCoastToday.com – Living – This 'CSI' has a New York state of mind – February 7, 2007". Archive.southcoasttoday.com. Retrieved November 7, 2010. ^ Petrelli, Gianni (December 22, 2005). "Un attore ripacandidese" [An actor from Ripacandida]. Retrieved December 25, 2015. ^ "Gary Sinise: Ensemble Member Bio". Archived from the original on December 15, 2007. Retrieved January 3, 2008. ^ "Baume & Mercier and Gary Sinise". Archived from the original on December 3, 2007. Retrieved January 3, 2008. ^ "In Step With: Gary Sinise". Parade Magazine. September 12, 2004. ^ "New Recipients Of Presidential Citizen Medals". WBKO. Archived from the original on July 16, 2011. Retrieved December 10, 2008. ^ "Sinise produces pro-military documentary". Upi.com. March 11, 2009. Retrieved December 17, 2009. ^ "Film review: 'Brothers at War' – Military Movies". Military Times. Archived from the original on March 16, 2009. Retrieved December 17, 2009. ^ "Gary Sinise | Hollywood Walk of Fame". www.walkoffame.com. Retrieved April 24, 2017. ^ "Gary Sinise Gets Star for TV Work". NBC Southern California. Retrieved April 24, 2017. ^ "Actor and Humanitarian Gary Sinise Selected as 2018 Tournament of Roses Grand Marshal". October 30, 2017. ^ "'Lt. Dan' flies high". June 10, 2011. Archived from the original on July 9, 2011. Retrieved June 28, 2011. ^ "Board of Directors" Archived November 13, 2011, at the Wayback Machine. Hope for the Warriors. Retrieved November 4, 2011. ^ Rosprim, Thomas (August 27, 2012). "MCPON Names Gary Sinise Honorary Chief". Navy News Service NNS120827-07. Retrieved September 3, 2013. ^ Seck, Hope Hodge (August 30, 2013). "Lt. Dan' Gary Sinise becomes newest honorary Marine". Marine Corps Times. Archived from the original on September 3, 2013. Retrieved September 3, 2013. ^ "Actor Gary Sinise becomes Honorary Marine". USMC - Marine Barracks Washington. August 30, 2013. Archived from the original on September 1, 2013. Retrieved September 12, 2013. ^ "Families of Disabled Vets | National Memorial Day Concert". PBS. Retrieved December 17, 2009. ^ Sinise, Gary (March 2016). "Gary Sinise on Giving Back to Veterans". Guideposts. Retrieved April 23, 2016. ^ "Gary Sinise to Receive 2015 Sylvanus Thayer Award". Westpointaog.org. ^ "Amherst College Commencement: 2003 Honorary Degree Citations". Archived from the original on September 16, 2006. Retrieved January 3, 2008. ^ "Gary Sinise In His Mission as The Messenger". Amici Journal. Retrieved April 12, 2011. ^ "Actor Gary Sinise describes his road to the Catholic Church". Catholic News Service. Retrieved February 14, 2019. ^ "Gary Sinise's Federal Campaign Contribution Report". Archived from the original on September 16, 2008. ^ "Actor Gary Sinise floated as possible GOP savior". CNN. May 11, 2009. ^ Dominic Patten. "Romney Eyes Hollywood Return After Successful Weekend Fundraiser". Deadline. ^ "Gary Sinise - Mr Trump, with all due respect, I fail to..." Facebook. July 20, 2015. Retrieved October 12, 2018. ^ "Alumni Association Announces Gary Sinise as Gibbons Medalist". The Catholic University of America. Retrieved September 9, 2016. ^ "United States Navy - Honorary Chief Petty Officer - Gary Sinise". NAVY.mil. ^ "United States Marine Corps - Honorary Marine - Gary Sinise". stripes.com. ^ "FDNY - Honorary Battalion Chief Gary Sinise". NYC.gov. Steppenwolf Theatre Company is a Chicago theatre company founded in 1974 by Terry Kinney, Jeff Perry, and Gary Sinise in the Unitarian church on Half Day Road in Deerfield and is now located in Chicago's Lincoln Park neighborhood on Halsted Street. Its name comes from the novel Steppenwolf by Hermann Hesse which original member Rick Argosh was reading during the company's inaugural production, And Miss Reardon Drinks a Little, in January 1974. Moira Jane Harris is an American actress. Rafael Peralta, assigned to the 1st Battalion, 3rd Marine Regiment, 3rd Marine Division, III Marine Expeditionary Force, Marine Corps Base Hawaii, was a United States Marine killed in combat during Second Battle of Fallujah in the city of Fallujah, Iraq. In September 2008 his family was notified that he was awarded the Navy Cross, the second-highest award a U.S. Marine can receive. In February 2012, Secretary of the Navy Ray Mabus announced that a new Arleigh Burke-class destroyer would be named USS Rafael Peralta. The Lt. Dan Band is a cover band founded by Gary Sinise and Kimo Williams to perform at USO shows, entertain troops, and raise money for disabled veterans. The band is named after the character Lieutenant Dan Taylor, whom Sinise portrayed in the film Forrest Gump. 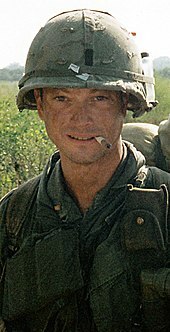 Sinise has said in interviews that many people know him by sight as "Lieutenant Dan" rather than by his real name, hence the band's name. The concept came about when Sinise asked for permission to bring musicians on his USO tours. The group was initially known as "Gary Sinise and the Lt. Dan Band". 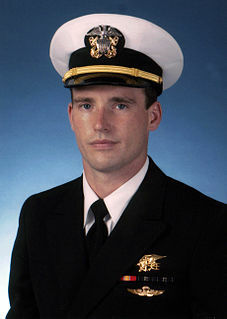 Michael Patrick "Murph" Murphy was a United States Navy SEAL officer who was awarded the U.S. military's highest decoration, the Medal of Honor, for his actions during the War in Afghanistan. He was the first member of the U.S. Navy to receive the award since the Vietnam War. His other posthumous awards include the Silver Star Medal and the Purple Heart. Kimo Williams is an American composer, musician and professor who has performed with a number of ensembles including his ensemble Kimotion and the Lt. Dan Band, that he co-founded with film/TV actor Gary Sinise. While he is perhaps best known for his work with the Lt. Dan Band, Williams has worked on a number of other projects including: award-winning photography, releasing four CDs, writing a stageplay and working on an opera based on the Courts Martial of Henry O Flipper, the first black graduate from West Point. Cognizant of the opportunities he had, as well as those he did not due to a childhood in which he moved often, Williams speaks to students about his history, their future and their need to combat mediocrity. Brothers at War is a 2009 documentary film directed by Jake Rademacher and produced by Rademacher and Norman S. Powell. The film follows several US soldiers in the Iraq War. The film's executive producers are actor, director, and Presidential Citizens Medal recipient Gary Sinise and Secretary of Defense Medal for Outstanding Public Service recipient David Scantling. Brothers at War won the Best Documentary Feature Award at the 2008 GI Film Festival. The film features an original score by Lee Holdridge and an original song--"Brothers in Arms"—by John Ondrasik of Five for Fighting. World War II in HD is a History Channel television series that chronicles the hardships of World War II, using rare films shot in color never seen on television before. The episodes premiered on five consecutive days in mid-November 2009, with two episodes per day. The series is narrated by Gary Sinise and was produced by Lou Reda Productions in Easton, Pennsylvania, United States.